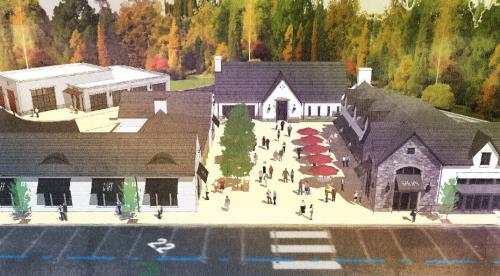 Plans unveiled Monday night for a new town center for Lookout Mountain, Ga., include replacing the current city hall with a "significant" new building and constructing a plaza in front that is flanked by two out parcels for possible development. Plans for the new town center started in 2007 when the old Mountain Market on Lula Lake Road burned down. Instead of rebuilding the small grocery store, Scott Maclellan, owner of the property, sold it to the town. Even though it appears nothing has been done in 11 ½ years, work on developing a plan has continued, said Mayor David Bennett. In 2008 the town hired consultant Phil Walker who met with residents of the community to determine what was wanted and the appearance of any development. At the presentation he made after the study concluded, the city was supportive, said Mayor Bennett. The town began following through with recommendations that Mr. Walker made, such as moving the public works department away from the core of what would be the “downtown.” Land was acquired and a new facility was built for public works on Lula Lake Road at a cost of close to $1 million. At the end of 2018 a survey was taken of town residents for the creation of a comprehensive plan that will guide future development of the town. It showed that 88 percent of the respondents were behind the plan, said Mayor Bennett. He said it was encouraging that no new ideas for the town center plan emerged during the time of the survey, which he said was an indication that the project is ready to move forward. Architect Bob Franklin was hired to do the plans for the new development which he presented at an unveiling on Monday night to a standing room only crowd of interested citizens. The idea, he said, is to create a distinct “sense of place,” giving examples of Franklin, Tn., Seaside or Rosemary Beach Fla. Even Gatlinburg and Pigeon Forge were used as examples. There is a reason many people go to those places and walk the streets and that is because they have a sense of place, he said, and Lookout Mountain, Ga. should have a sense of its own. This is defined by an awareness that one has arrived and a sense they have left, not just a place that people drive through. The plan as presented is to tear down the old city hall and build a significant building in its place. The current fire and police building behind city hall would have an addition and be remodeled. Facing Lula Lake and in front of city hall would be a plaza flanked by two outparcels that the city hopes to sell to developers for commercial property. If the two parcels are not sold, they would become green space. An access street to the right of the buildings would lead to a parking area behind the city hall. Diagonal parking was also recommended along Lula Lake Road in front of the development. That is expected to slow down traffic, said Mr. Franklin. Construction is expected to begin by the end of October. To make the buildings fit the character of the community, materials such as stucco and painted brick with mountain stone accents are planned for the municipal properties. Mr. Franklin’s vision is that all the buildings should not be the same. If they all match, he said, it would be too homogeneous. The exterior materials of the buildings could easily be changed from the original drawings, he said. Concerns expressed were about street parking which has the potential to create a lot of accidents, according to several speakers. That area of Lula Lake Road is high speed, which has been downplayed, they said. The potential that taxes could be increased for residents was also cited as undesirable, with the tax rate already high in the town, said one speaker. If the outparcels are not sold to developers, could the plan still be financially viable? asked another. Commercial buildings are wanted, answered Mayor Bennett, but it can be done without them, he said. Another comment was that some controls should be in place to guide the appearance of the commercial buildings which would not be owned by the city, to ensure that they fit the town’s vision. A second meeting to explain the Town Center plans will be held at city hall next Monday at 6 p.m. Comments and questions can also be sent to towncenter@lookoutmtnga.com.